Charles City junior Lauren Connell returns a shot during a No. 5 singles match against Waverly-Shell Rock senior Rachel Roose. After losing the first set, Connell bounced back to win the second to force a super tiebreaker that Roose won, 11-9. 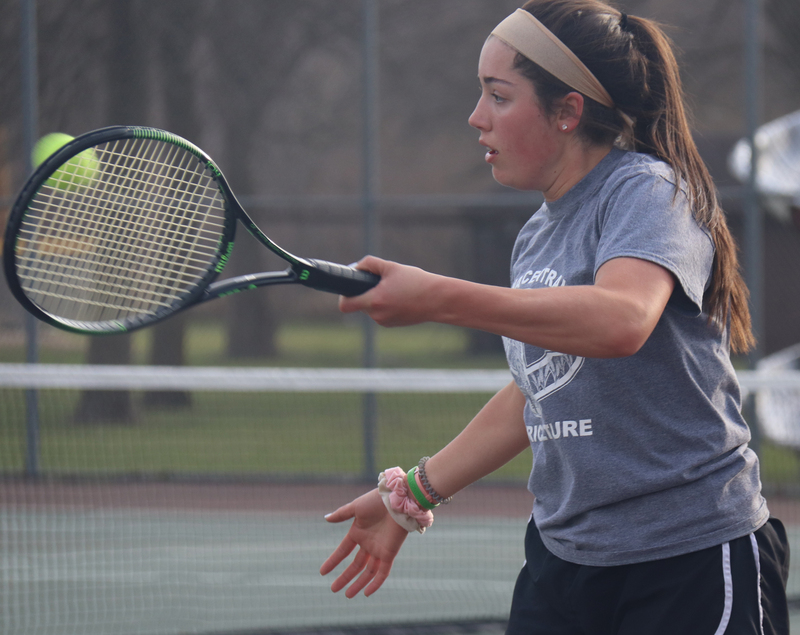 CHARLES CITY — Lauren Connell was on the cusp of earning the first varsity tennis match victory of the season for Charles City during the Comets’ home meet against Waverly-Shell Rock, Monday at Sportsmen’s Park. Playing against Go-Hawk senior Rachel Roose in the No. 5 singles match, the Comet left-handed junior lost the first set 6-2 before roaring back to win the second 6-3, forcing a “super tiebreaker”. There, Connell went up 6-5 in a race to 10. But in a tiebreaker that featured repeated long rallies, Roose managed to rally herself and went up 9-7 — a point away from victory. But Connell wouldn’t go quietly as she tied the tiebreaker at 9. Roose won the last two points to finally put away a stubborn Connell. The match capped a 9-0 sweep by the Go-Hawks, who improved to 3-1 for the season. Charles City fell to 0-3 and will host Oelwein on Tuesday. The other scores were Olivia Phillips defeating Jodie Sindlinger 6-2, 6-1 in No. 1 singles; Sadie Hansen defeating Amy Boggess 6-1, 6-2 in No. 2 singles; Katie Wichman defeating Kayla Kellogg 6-3, 6-1 in No. 3 singles; Molly Ramker defeating Taylor Walters 6-3, 6-0 in No. 4 singles; Brooke Willis defeating Jacie Wink 6-1, 6-1 in No. 6 singles; Phillips-Hansen defeating Sindlinger-Boggess 6-1, 6-0 in No. 1 doubles; Wichman-Ramker defeating Kellogg-Walters 6-2, 6-1 in No. 2 doubles; and Roose-Willis defeating Connell-Wink 6-4, 6-1 in No. 3 doubles. In the junior varsity matches, Charles City won four to Waverly-Shell Rock’s two.